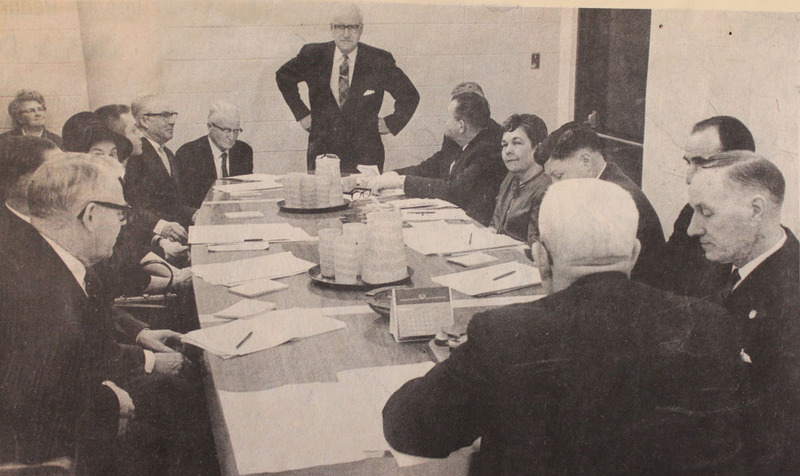 This newspaper photo from 1968 shows the Regional District's board, meeting in their first rented premises, in the Victoria Medical Building. The 1968 Board of Directors included: George McAndrew (Chair), Harry Loder, A.M. Sheppard, R. Lebans, Mrs. H. Blackman, J. Elliot, L. Johnson, Mrs. E.H. Thrope, J. Hewitson, Harold Mann, Mrs. Nancy Middleton, G.E. Hicks and J.E. Perry.